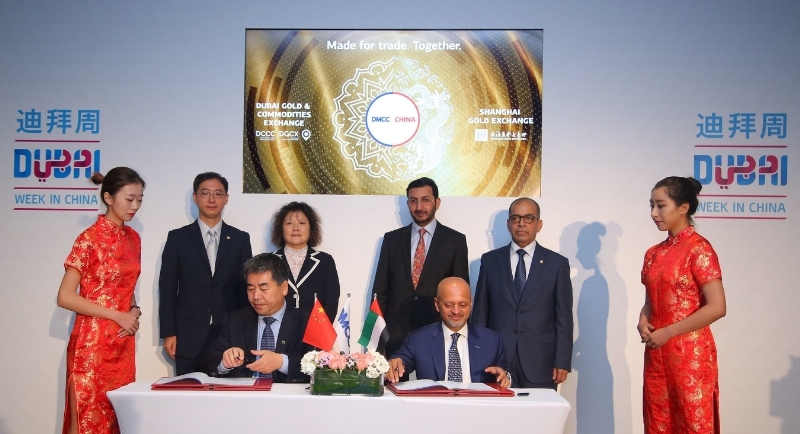 DUBAI, UAE: PRNewswire: DMCC, Dubai’s Government authority on trade, enterprise and commodities and the world’s number one Free Zone, concluded Dubai Week in China, Shanghai, with three significant commodity trade agreements and its “Made for Trade. Together” in Shanghai Forum. DMCC’s event attracted over 130 senior government officials, business leaders and financial institutions including His Excellency Abdulla Al Saleh, Under Secretary of the UAE Ministry of Economy for Foreign Trade and Industry Affairs; Consul General His Excellency Ibrahim Al Mansouri, Consulate General of The United Arab Emirates of Shanghai; Jiao Jinpu, Chairman, Shanghai Gold Exchange; Gautam Sashittal, Chief Executive Officer, DMCC; Matthew Pang, Managing Director of Mega Capital; and Zhonghua Chi, General Manager of Yunnan State Farms Group. The Dubai Gold and Commodities Exchange (DGCX) announced the first yuan-denominated gold future product to be offered outside of China, obtaining a license from the Shanghai Gold Exchange (SGE) to list Shanghai Gold Futures in Dubaiusing the Shanghai Gold Benchmark Price. The Dubai Gold and Commodities Exchange (DGCX) also announced that Agricultural Bank of China (ABC) has become the first market maker for the Shanghai Gold Futures contract to be listed on its exchange. DMCC signed an agreement with Mega Capital Halal (MCH), a Hong Kong-based holding company, to import coffee annually from China’s Yunnan State Farms Group to Dubai for world distribution. The agreement will see MCH export Chinese Arabica beans from the Yunnan State Farms Group to Dubai. DMCC will also develop a Coffee Centre. Based on the highly successful DMCC Tea Centre, which has enabled the UAE to become the largest re-exporter of tea in the world. DMCC also launched the latest in a series of reports on ‘The Future of Trade’, hosting a roundtable of experts to discuss the ways that trade is changing the world. The report focus heavily on the potential for digitalisation to impact trade, stating that as many as 350 million businesses would begin exporting goods for the first time if they were to adopt an end-to-end digital strategy. There was also considerable interest in DMCC’s Free Zone, named the Global Free Zone of the Year 2016 by The Financial Times fDi Magazine for the second year running, and its Business Panel debate ‘Making Business Happen in Dubai. Together‘. Panel Speakers representing leading Chinese companies based in the DMCC Free Zone in Dubai, Zhu Jianchao, Vice president/Chief Engineer; China State Construction Engineering Corporation; Wu Qing, Administration Manager, PowerChina; Robert Wang, Technical Director, Hikvision; and Timothy Chong, Director, Mega Capital; shared their views on why DMCC is such a pro-business place, and how Dubai’sworld-class infrastructure, connectivity and partnership approach create a unique environment for Chinese companies to drive growth in the Middle East, Africa and beyond, and opportunities to forge closer ties between the twin cities of Dubai and Shanghai.